Canoe. Bike. Run. 160km total split into 14 stages. 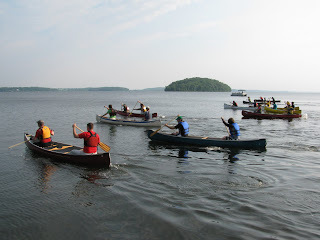 Teams of up to 15 people... and all of it set in the beautiful Oak Ridges Moraine, a huge swath of wilderness across the top of Canada's biggest city. We did this in 2010 as the "Trail Pythons", mostly just to explore it and see what it was all about. This year we're taking what we learned and we've put together a more competitive team, "Blood of the Ridge" (woooo, scary!). Hopefully this will translate into a better result (and we won't finish in the dark!). We have 8 team members this year, which is pretty much ideal. Each of us are doing 1-3 stages. I'm doing 2 bikes and 1 run, which is about the limit without starting to get a pretty good drop-off in performance. We have an excellent canoe pairing and we've recruited an additional cyclist so we don't have to force runners to bike... all of which has me confident we'll be fast! I'd love to see us in the top 5... or higher? ... do it! It's awesome. The biggest challenge isn't out on the course, it's organizing the team. Finding a group of committed people who are going to come through is not easy, then you have to figure out stage assignments while dealing with everyone schedules and strengths. You get to play accountant and try collect the entry fees, and of course every stage is point-to-point, so you have to figure out transportation of people and vehicles. Somehow in all of that, we managed to have people ready to go at every stage last year - hopefully this year we can pull it off again! See you on the Moraine. Loved your comments on this event! Myself and my team will be doing the Adventure race now. What leg of the race are you doing this weekend at the Moraine for Life Adventure Relay 2011, would love to chat more about your blog! Please email me so we can get in contact! Hey Peter! I'll be there start to finish organizing our team and keeping everything moving, and I'm doing stages 6, 8 and 10. Good luck tomorrow!